Due to a rare alignment of coincidences, Brian and I were able to join up again for a hard 14er traverse; our last big traverse effort together was the successful Crestone traverse just over 1 year ago done to celebrate my 40th birthday. We both wanted to do the Maroon Bell traverse, but for different reasons. 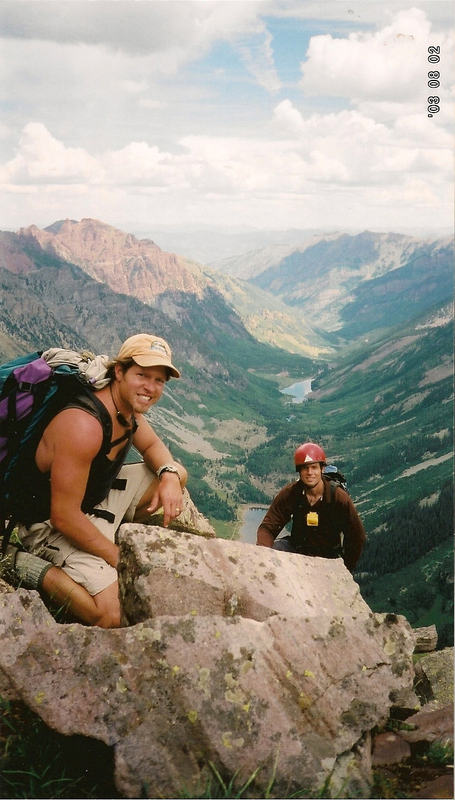 Brian had attempted the Maroon Bells traverse seven years prior (summited on North Maroon Bell, but not on South Maroon Bell) while I climbed South Maroon Bell (SMB) in 2002 but had not attempted North Maroon Bell (NMB) yet; a successful traverse would check-off a peak for both of us. Plus, it is one of Roach’s “Great Traverses.” We had to do it. Our planning discussions led us to plan on a N-S-N traverse with a N-S option if the weather was bad or we were too slow. I had done the standard SMB route and felt confident I remembered the trail. Brian felt that the double traverse and descent via NMB would be faster and easier, if we could finish the traverses before the weather came. On Thursday night I made my dutiful check on the weather forecast; and it was bad. The forecast called for “morning thunderstorms and rain and afternoon thunderstorms and rain; chance of precipitation 50%.” It was the worst forecast I’ve headed into yet; and this effort would have the longest exposure to weather problems of any climb we’d done to date. Still, we’ve done enough climbing over the years to know just how unpredictable the weather can be…we decided to proceed and hope for luck. 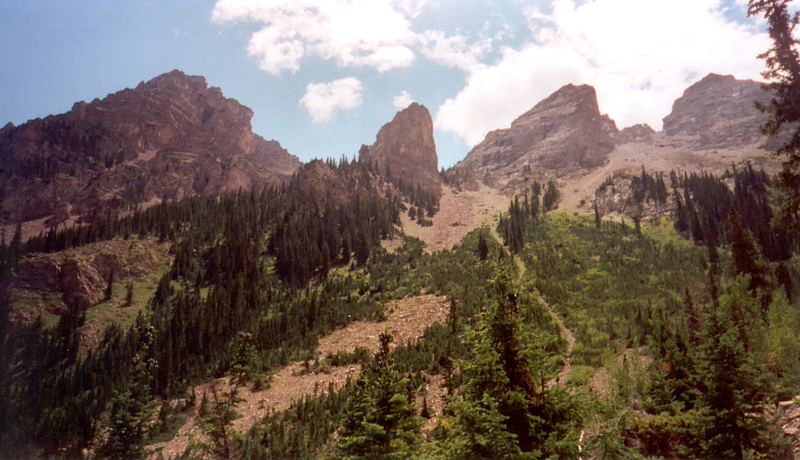 We started toward Aspen on Friday, August 1, 2003, in the late afternoon with a plan to hike up to a campsite near the starting point for NMB. Our driving speed was good the entire way and we arrived at 8:00pm. Anxious to make progress before dark, we quickly hiked up from the Maroon Lake Trailhead west before the fading daylight forced us to pull out the headlamps prior to the cutoff for Pyramid. Now hiking more carefully, we continued up in the dark, past Crater Lake, and watched carefully for the turnoff for Maroon-Snowmass Trail. We found it and took it for approximately 0.5 mile to where we found a previously used campsite, 20 feet off the trail and buried in the trees. We setup camp and turned in with hopes of a restful nights sleep (position #1 on map). I didn’t sleep well and so the pre-dawn alarm was not welcome. 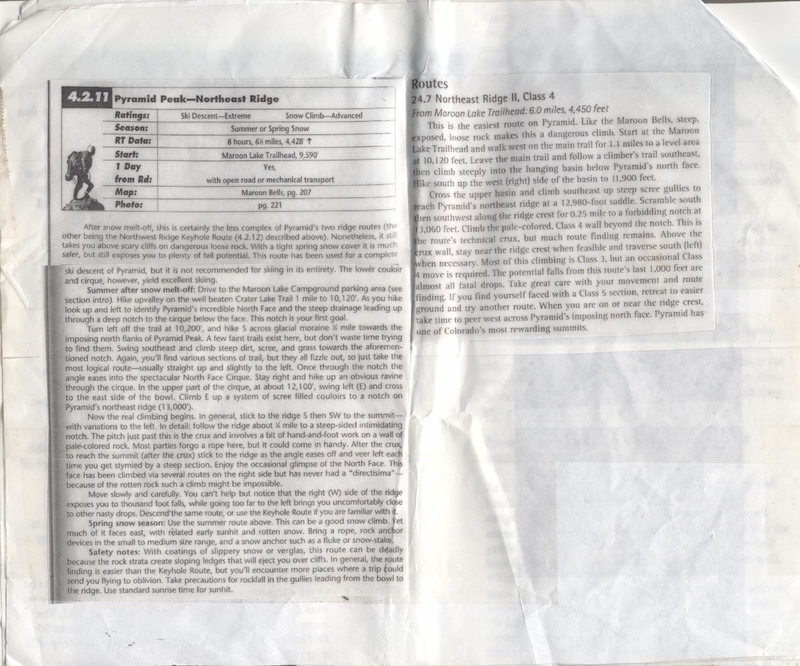 But with our bad weather forecast, we both jumped up and got ready for our big day on August 2nd in 2003. We quickly found the cut-off a short way above our campsite. We crossed the Minnehaha Creek before we wandered up through trees and rocks to reach a grassy area and then a rock glacier below North Maroon’s North Face as the daylight started to pick up. Brian had been more of a speed devil than ever; and I kept up until I was ready to puke. Oddly, I really felt bad and needed a 15 minute rest in the talus field in the basin below NMB’s north face to recollect myself (position #2). I felt bad enough to go home. Each of us has a sustainable pace based on our conditioning, our physical mechanics, and the situation; going too fast means to risk illness (mountain sickness, deydration, bonking), injury (falls, twisted ankle) and loss of situational awareness (concentrating too much on footing). Starting to feel better and anxious not to lose the weather, I started up again. We completed the traverse of the rock field and found a trail at “a point below the lowest cliffs on the NE ridge”. We used that trail to do an ascending traverse below the cliffs to get to a broad grassy gully. It was a very cool setting: a thin trail cut into side of the mountain and a magnificent drop down to the valley floor. We followed the trail south under the grassy gully, and then we started up the left side of the gully following a worn trail (position #3). We climbed about 600’ before exiting on the left side below some white cliffs. 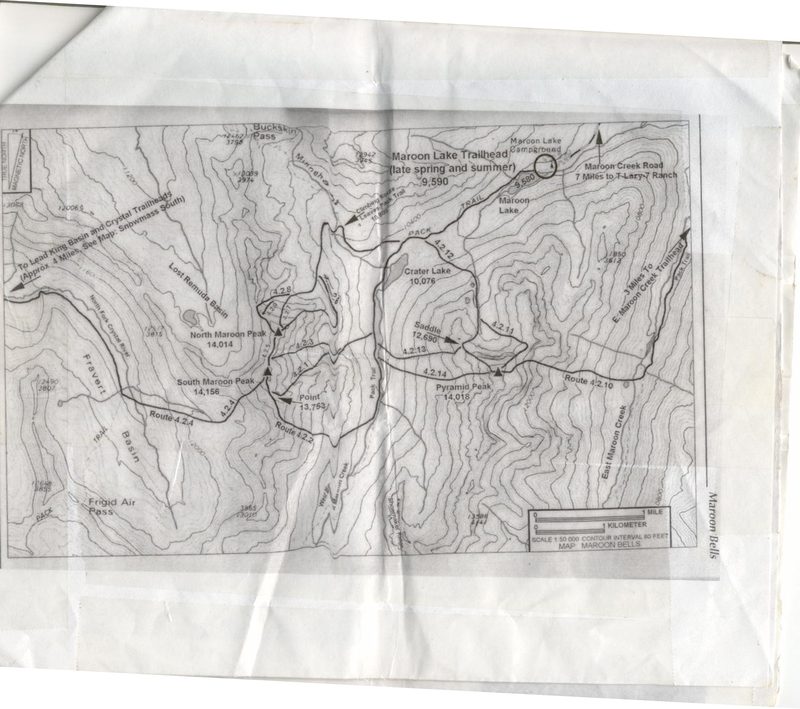 After we exited the grassy gully, we turned a corner and traversed across ledges to reach a 2nd gully (position #4). Just like South Maroon Bell, the North is a steep pile of rocks just barely hanging on before committing to a suicide plunge to the bottom. Every rock we stepped on was a potential death missile for any below us. In the 2nd gully, we worked our way higher to reach some challenging ledges below the ridge crest. We then hiked up the remaining distance to reach the ridge at approximately 13,100’ (position #5). We stayed approximately on the ridge the rest of the way. The first major obstacle we found on the ridge was the infamous “rock band” at around 13,600’ where we took our first break. When I filled my water bottle at the rock band, it was full of moss specks, and some had six legs. I used two iodine pills. Unfortunately, this turned out to be my only refill opportunity up high….I would have to survive on 3 liters until returning to Minnehaha Creek. We passed the rock band using a short Class 4 chimney, and then we navigated around numerous obstacles to stay near the ridge crest all the way to the NMB summit (position #6). To our delight, the weather was holding. But we didn’t trust it; so we only dared stop for a quick snack before starting the traverse. From the NMB summit, we started by following Roach’s instructions to descend southwest from the summit. It was a surprisingly exposed first move for a 14er, but it was an effective foreshadowing of things to come. We scrambled down a loose talus slope and then climbed up, over and around various obstacles to reach a 20-foot cliff that we downclimbed without much difficulty. We continued the obstacle course until above a 35 foot cliff we couldn’t figure out how to downclimb safely (position #7). We rappelled to the bottom and continued. This was the only very difficult part of traverse, other than for the constant exposure to terrifically long falls that would provide the victim enough time to regret the error. We had to downclimb two short cliff sections to reach the low point of the traverse, which was also the top of the Bell Cord Couloir. From there, we began our ascent to SMB. We started up some ledges and then climbed up a gully to reach additional ledges which led to the east end of the summit ridge. The last scrambling section was disappearing beneath our hands and feet pretty well when a big commotion behind us caused us to stop and look. It was a group of college-age men who were running up the route and racing each other to the SMB summit. We stood aside to avoid being trampled. 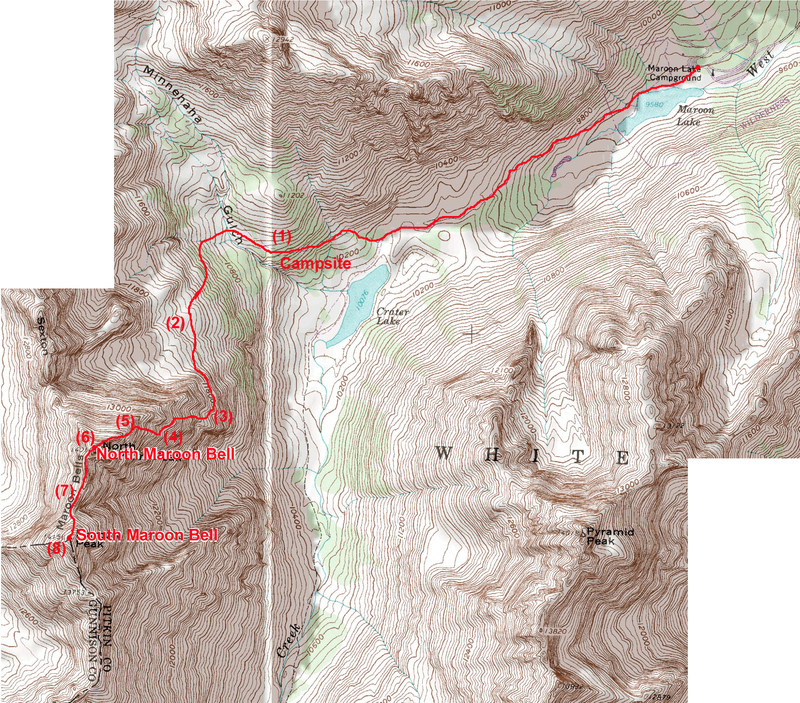 Once on the summit (position #8), we learned they had run up NMB and over the entire traverse. As I was breathing hard from my own modest efforts, I was impressed with their physical ability to do it….even as I was annoyed at the lack of courtesy involved in the process. The weather was holding, but just barely. We decided we could make it back across the traverse to NMB based on the hope that our familiarity with the terrain would compensate for the slowing of our tired bodies. We just needed the weather to hold out a couple more hours. From South Maroon‘s summit, we returned to the north along the summit ridge to the northeast corner of the peak and started for home. We descended to the west through a series of small cliff bands and then down a loose gully. Once down the gully, we turned to the north and traversed a series of small ledges to reach the top of the Bell Cord couloir. From the low point in the traverse, we climbed up the first 20 feet of the cliff to a small ledge, from which we scrambled another 20 feet to mount the cliff band. From the top of this cliff band the ridge flattened out and narrowed to only a few feet (with a big drop-off to either side). We scrambled for a while along the ridge toward a 20 foot tall bump on the ridge. We climbed up and over the spire and then down climbed another small cliff band. More scrambling led us to the cliff that forced a rappel earlier; this time we were able to find a climbing route to get past. We continued staying mostly to the ridge until we returned to the last section below the summit. We climbed up some talus and then some ledges to reach the summit ridge, and finally the summit where we had been a few hour earlier. I’d have to say that I preferred the South-to-North pattern due to the predominance of climbing up vs. downclimbing. Everything had gone better than we had a right to expect. The only real discomfort was my increasing dehydration. Of course Brian was satisfied with his thimble-full; but I needed more than 3 liters for such work. Plus, I still had a touch of the mountain sickness I caught early in the day, and I was very anxious to begin losing some serious altitude. I’ll admit to being irritated that nothing looked the same on the descent of the gully. North Maroon Bell is not a friendly mountain. I tried to follow the cairns but once again found myself lost in a sea of loose rocks. I managed to avoid knocking anything loose, but it was a serious mental strain. About 1/2 way down the gully, it started raining and then stopped. And that was the last of the weather. We had really gotten lucky in two ways. One, the weather was good despite a bad forecast, and, two, the bad forecast had kept the crowd to a manageable level. I would hate to do NMB or the traverse on a good weather forecast weekend day; the rockfall would be deadly. Exhausted, we slowly made our way to the Minnehaha creek. While approaching the creek, the idea formed in my mind to soak my feet in the freezing water to cure my “fire toes.” I had been thinking about this for a long time, but never took the time to try it. With the willing sacrifice of a few minutes, it felt so good to freeze my feet after filling my water bottles. But then Brian reminded me that we need to get to camp to break it down and hike back to the car (Brian’s Mustang, “The Mach”) before starting the long drive home. Reluctantly, I put on my socks and boots and starting hiking, only to find that my feet hurt worse than ever! The cold water treatment had turned on every nerve ending in my feet and turned every callus into soft cheese. Oh, the misery! The 2 mile hike back to Brian’s car was an ordeal….like hiking with broken glass in my boots. But, once off my feet and with Brian driving home, I was able to reflect on a great trip. I was pleased to have completed another of Roach’s Great Traverses and bag my 48th 14er. This trip was one of the great ones: full of strenuous effort, difficult problem-solving, and mortal danger; and our betting against the weather forecast and winning made the victory all the sweeter. The church bells need not toll for us, except in celebration. And as I thought about having only ten more 14ers to go, I discovered that I was both happy and sad. 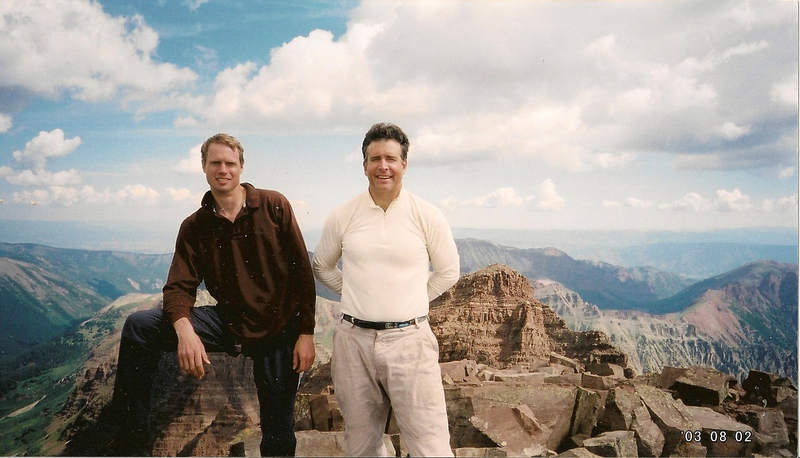 I had become addicted to the mental, physical and emotional challenges found on the Colorado 14ers. 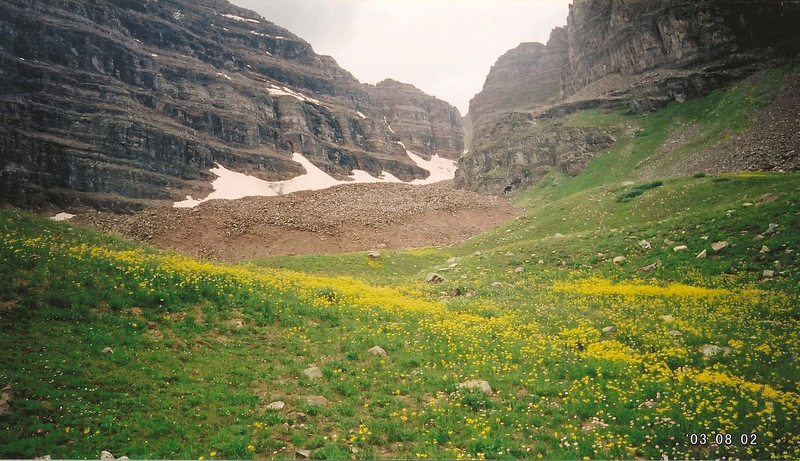 Before the month’s end, I’d planned for another seven 14ers to fall beneath my Makalus: Chicago Basin Group (8/14/03) & Wilson Group (8/6/03). 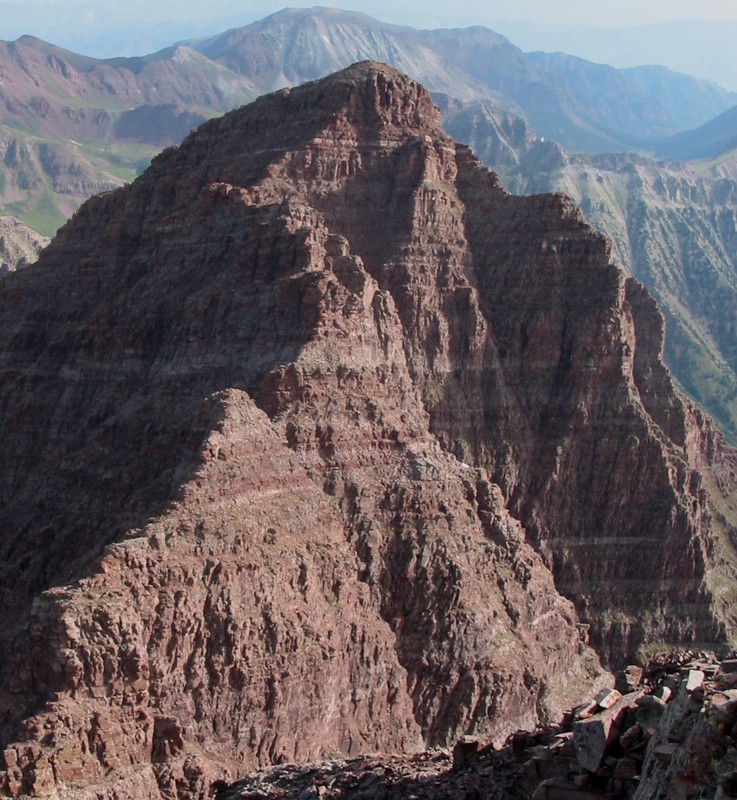 The list of remaining 14ers would soon be very short indeed. 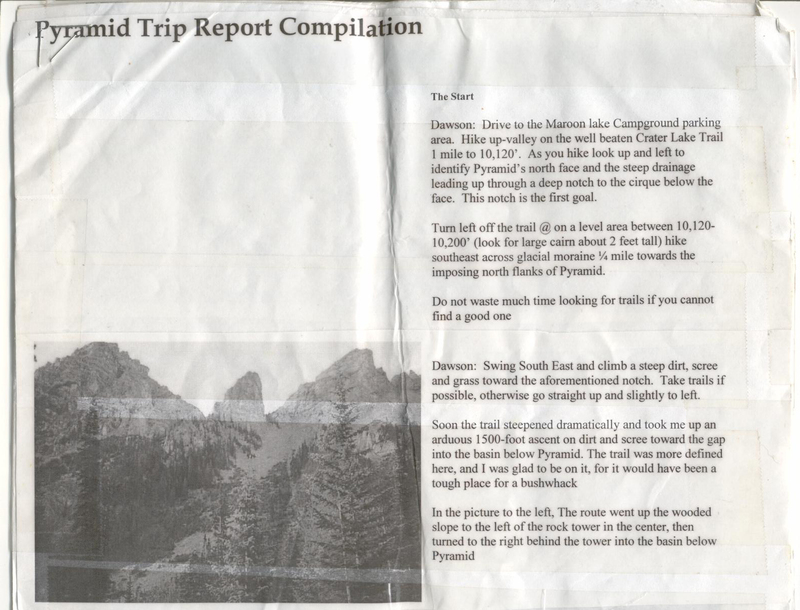 And a big ‘thank-you’ to Brian for thinking of a great trip report title. 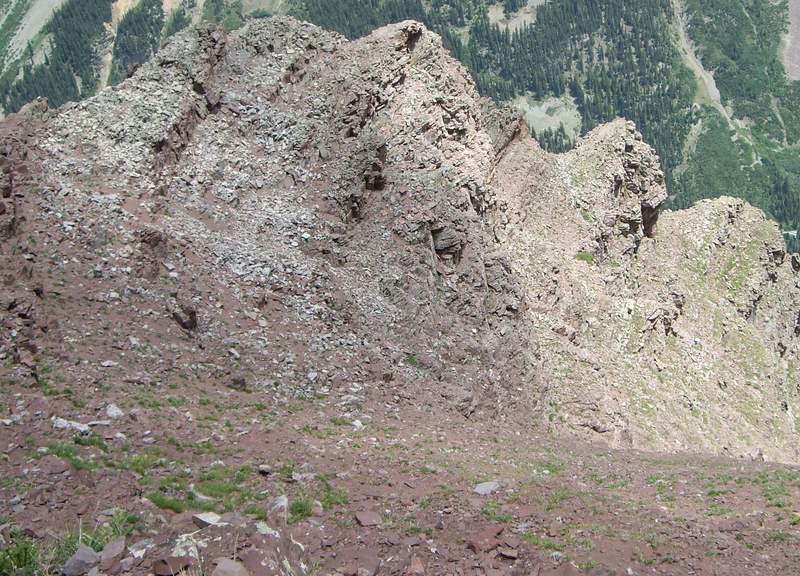 Nearing the end of my 14er list, I finally had to face my fears about Pyramid Peak. I wanted to fit in an attempt between my previous weekend’s climb of Capitol (with Mark) and my planned North/South Maroon traverse for the up-coming weekend (with Brian). By “fit in” I mean, squeeze in with enough time to recover from the first and to recover for the second. The weather report and my schedule cooperated; Wednesday was selected for a Pyramid attempt using the NorthEast Ridge route. 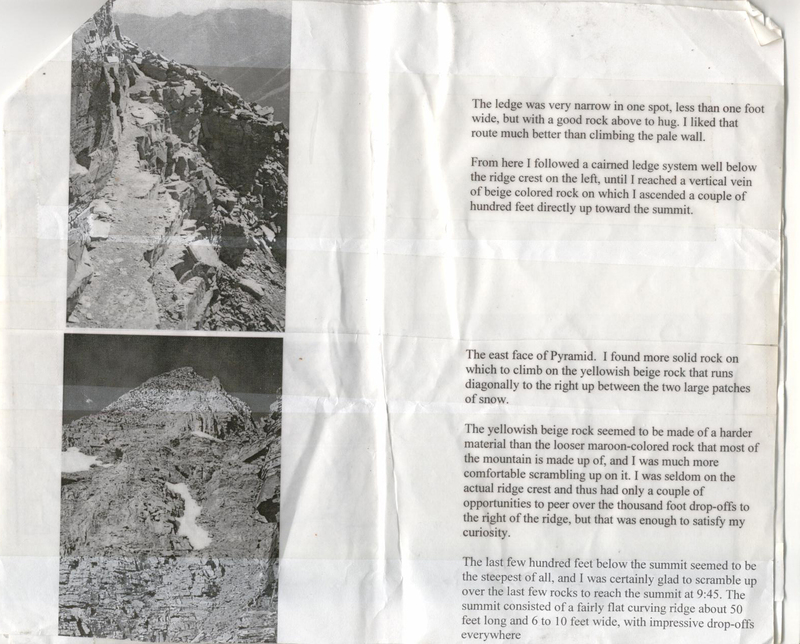 To alleviate my fears of this peak, and to respond to my poor route finding effort on South Maroon Bell 12 months earlier, I prepared a well researched route finding guide with photos, topos and route descriptions from multiple sources….all covered in packing tape. What could go wrong this time? 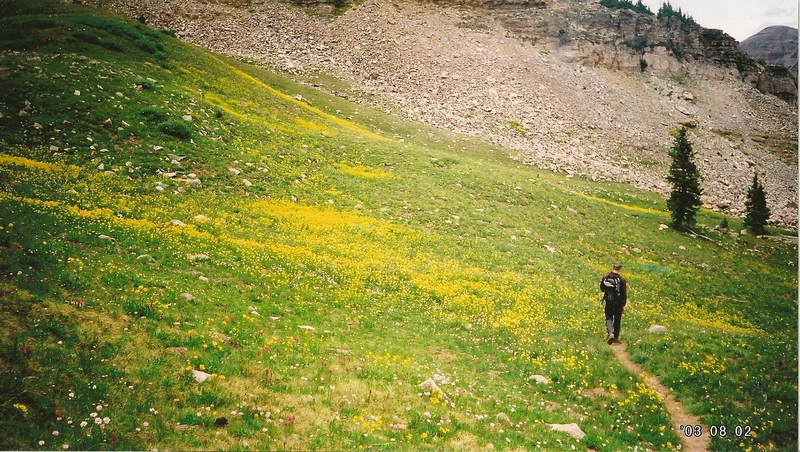 On July 29, 2003, I left Boulder at 12:45pm for Aspen and Maroon Lake. I arrived at 4:30pm (30 minutes before the Rangers leave) and took a minute to consider my options. Basically, I could either enter the park now to see if the park had any available camping sites (and pay for the privilege of sleeping and parking) or wait until the Rangers left and find a place to park the 4Runner for a short sleep in the back. I was not sure of the risks associated with an unauthorized overnight park and decided that if I could sleep and park legally, I would do so. I ended up paying $20 for a noisy night in Silver Bell campground, but did have the use of a comfortable toilet. Don’t laugh. A toilet may seem like a small thing in this reading, but let me be clear about the comforting reassurance that a well-stocked bathroom can bring to a civilized person who enjoys playing at being a backcountry adventurer – it is a tremendous luxury. Perhaps one cannot be a “real” mountaineer until toilets mean nothing. If so, I will never be a real mountaineer. I woke up at 4am, packed up and drove to the Maroon Lake parking area. I was hiking at 5am in total darkness (no moon). My last trip to Maroon Lake a year ago had prepared me to find the proper trail without signage or other visual clues. Unfortunately, I had a case of the “Slows” and could not get my speed up past moderate, but I continued to make acceptable progress given my early start. I found the climber’s trail turnoff in a rocky area at about 10,100’ and turned left up and through the short rocky slope toward the Pyramid hanging basin. The trail wound around the easy terrain in an absurd fashion like the desperate attempt of 2-inch tall men following the line of least resistence through a range of 2-foot tall mountains. The trail was at least easy to follow in the morning light, and, once across the moraine, the trail turned upward and made a steep ascent of the slope directly below the Pyramid Hanging Basin. 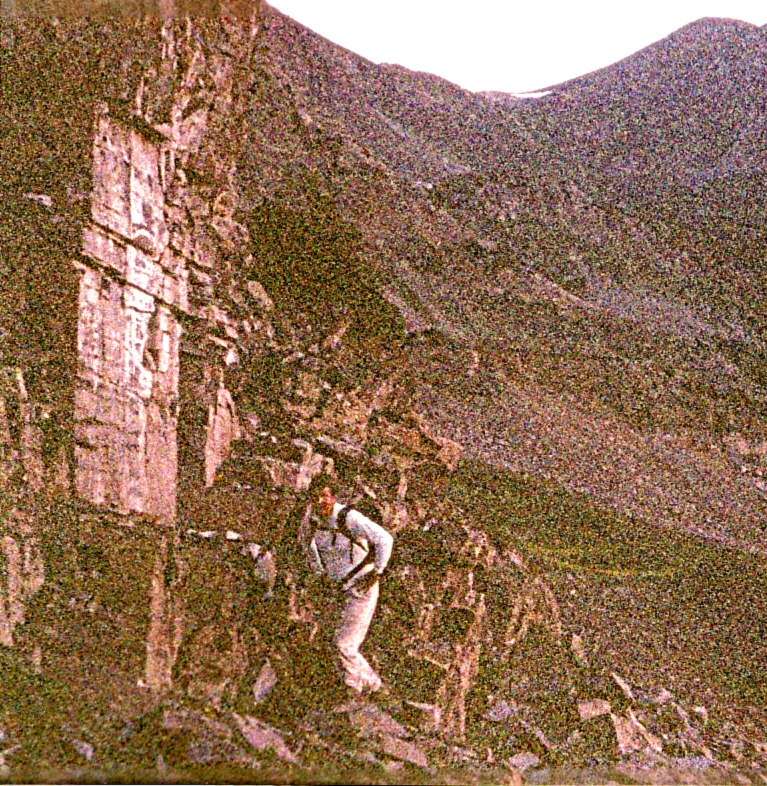 At 11,600 feet I entered the hanging basin and began a boulder hopping exercise toward the North Face of Pyramid, using a narrow tongue of snow at the centerline whenever possible. The basin was like a wild sea frozen in time. 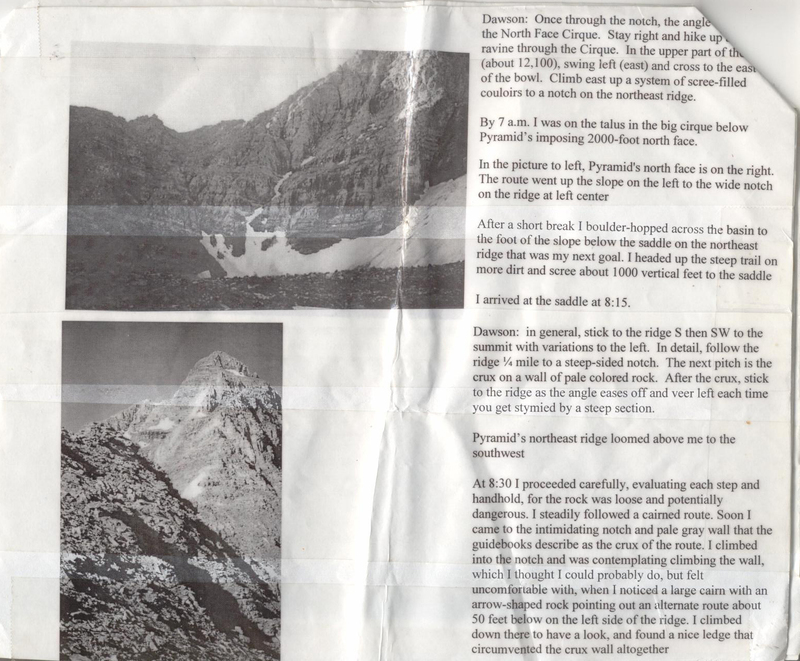 The cliffs of Pyramid and subsidiary ridges on either side have been depositing tons of rocks atop an ancient glacier, which had settled into ridges and depressions across which I climbed a circuitous route to avoid elevation loss. I passed by an ice cliff that appeared to be the edge of the glacier that had partially melted leaving a massive depression in the rock area beneath it. It was an amazing feature for Colorado. From the ice cliff, I could see my route up to the eastern shoulder of Pyramid. At 8:30am, I reached the Northeastern ridge of Pyramid using a side gully angling right a few hundred feet from the top of the shoulder. I took a moment to rest and eat, and I pulled out my climbing notes for a quick refresher. I had two basic instructions gleaned from guidebooks and trip reports to guide me: (1) stay on the ridge and go left when necessary and (2) follow the cairns. It soon became apparent that these instructions were incompatible. The cairned route stayed near the ridge for a short while working initially to the right side of the ridge and then back to the ridge. Within a hundred yards, I came to a gully on the left that had cairns 30 feet below me. I figured this was the “go left when necessary” part, but it was not so. By leaving the ridge to follow these cairns, I would not again attain the ridge until reaching the summit. 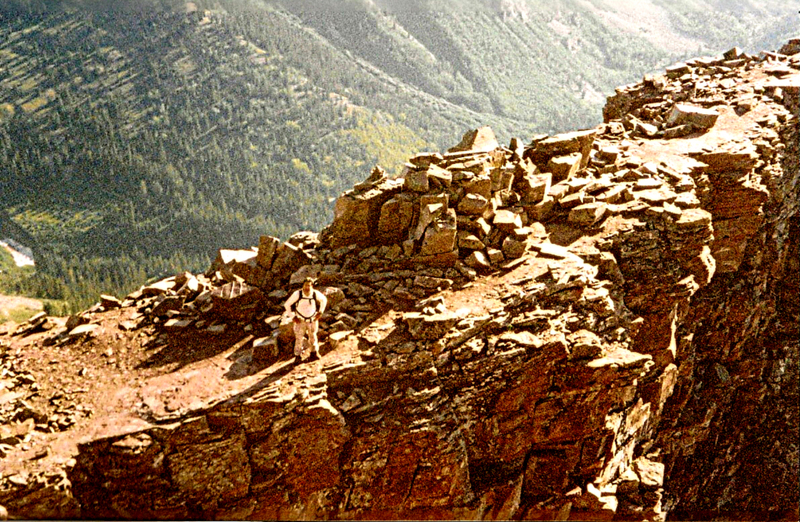 The cairns led to a narrow walking ledge that was reminiscent of the Narrows on Long’s Peak but without the exposure. At this point, I simply gave up on the NE Ridge and decided to place my trust in the cairns and my “nose” to guide me to the summit. Faith comes hard, but I have learned some hard lessons. 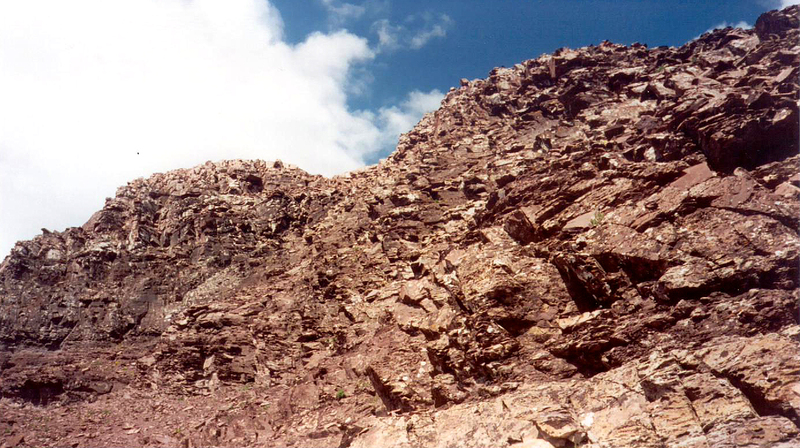 The East face of Pyramid can be generally described as a steep rocky incline split down the middle by a great gully. 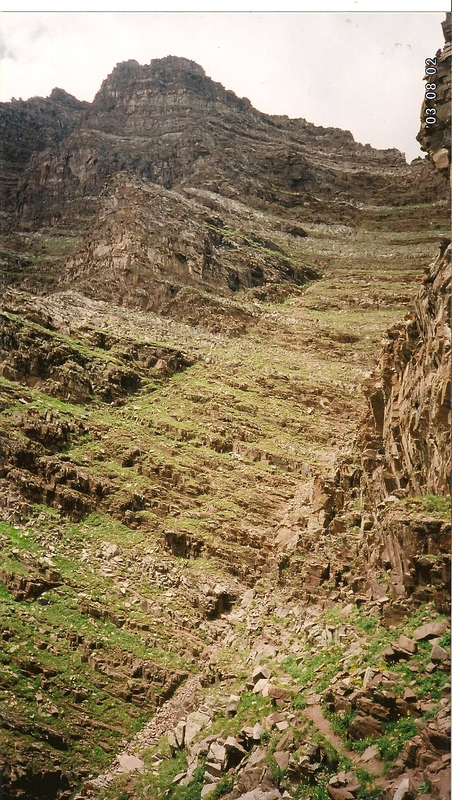 The climbing occurs on the right hand side of the gully, and eventually exits into the gully near the summit to avoid steep cliffs that cap the top of the right hand portion of the face. 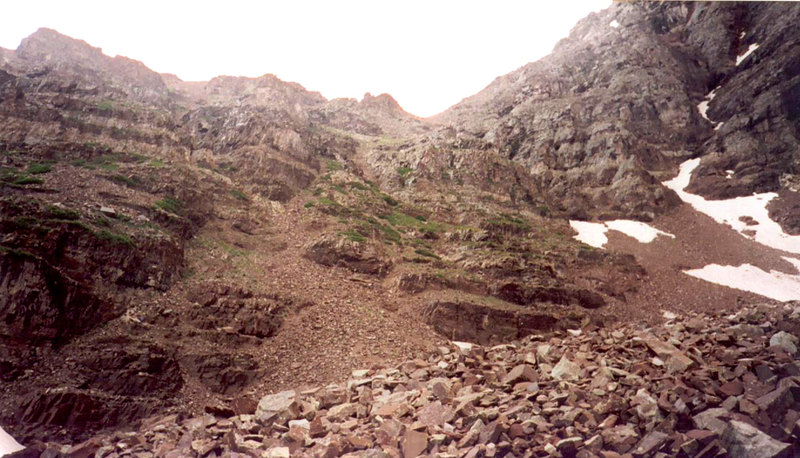 The cairns generally led from the right side of the face upward and left, toward the middle of the face without entering the great gully. The cairns marked ledges (where else can you stack a pile of rocks), between which any number of climbing options existed for ascent to the next ledge. I simply followed my nose and found mostly 3rd class climbing. There were two more difficult sections that required me to use a “face in” down climb method later in the day. Overall, I was delighted to find the climbing to be straight forward. I reached the summit at 9:45am. I took a break to rest and locate the 14ers in the area. 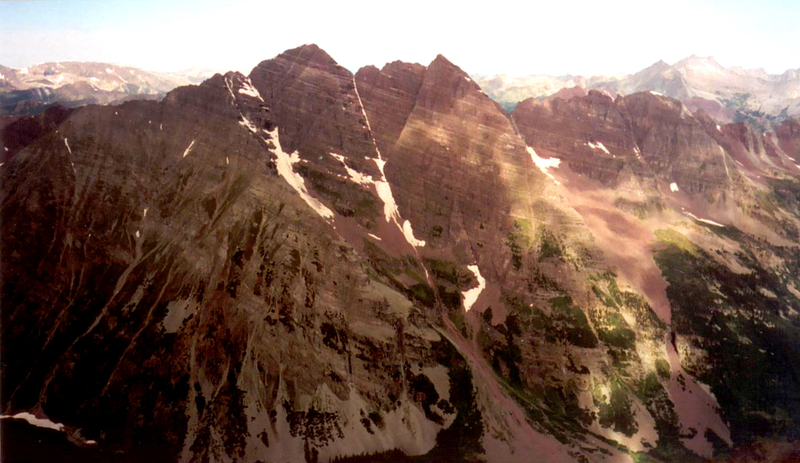 In particular, I studied the the approach to N. Maroon Bell and the Maroon Bells ridge and that I planned to do a few days hence. 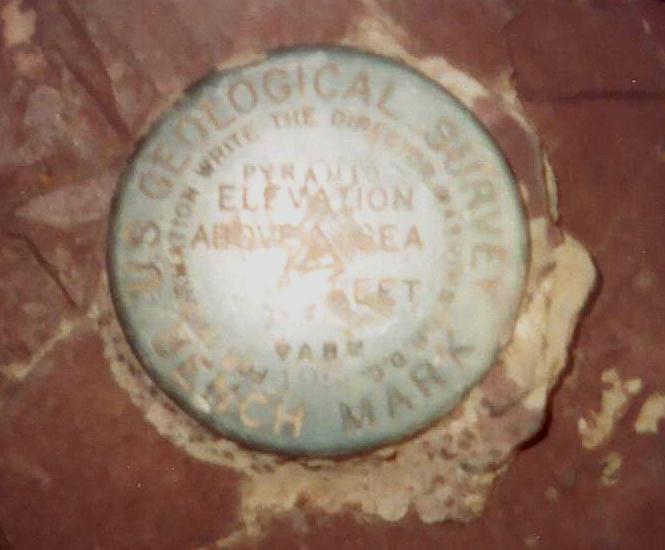 I did not find a register to sign, but I did find the survey marker. I also saw a trail coming up from the NE ridge, which I abandoned earlier in the ascent. After my break, I walked over to inspect it and see if it would make a good descent route. I was torn, but decided I would descend using what I knew to minimize the chance of delays on this cloudy day. I left the summit at 10:15. The descent was a bit trickier than the ascent. Climbing up over gravel covered ledges can be done safely by controlling the weighting of each step. However, down climbing is more difficult due to lesser control over weight shifts. By going slowly and taking care to follow my original ascent route, I made it to the saddle without incident. 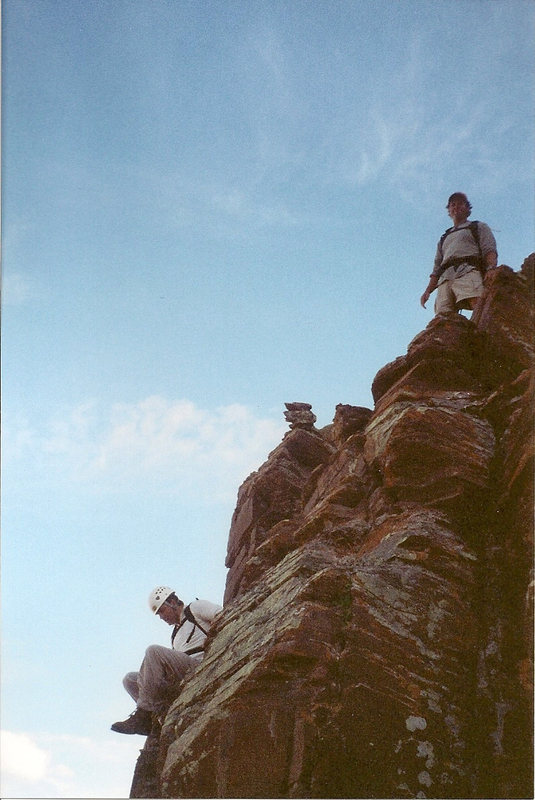 One of the unique aspects of Pyramid, shared by the Maroon Bells, is how the climbing is still strenuous even after the climb is emotionally done. I was ready to claim victory after reaching the saddle, but still had to descend much steep and difficult terrain before returning home to my family. 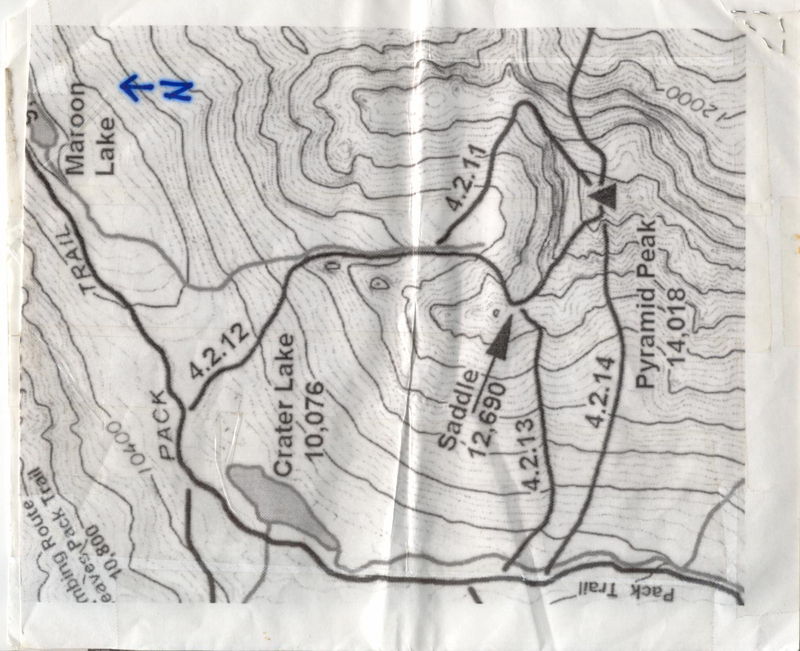 I moved deliberately but purposefully and reached the Crater Lake trail by 1pm, and reached the car by 1:30pm. It was an enjoyable adventure, but I was glad it was behind me. Forty-seven down; eleven to go.